C.T.S. Nair is Chief Economist, Forest Economics and Policy Division, Forestry Department, FAO, Rome. In many sectors small enterprises have long dominated economic activity, yet they face new challenges in the context of globalization. 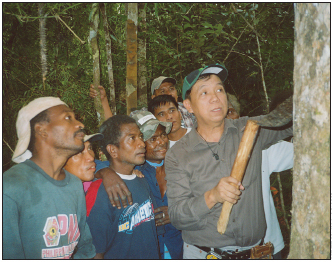 What lessons for forest-based small enterprises can be drawn from the larger picture? A lead article in Time magazine in December 2005 highlighted the decline of the once-renowned Italian wooden furniture industry, primarily attributed to competition from Chinese exports (Gumbel, 2005). 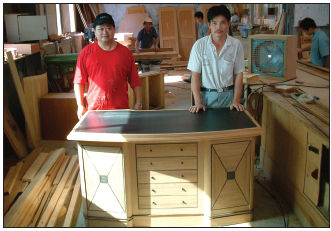 Interestingly, in both countries furniture is largely produced by small and medium-sized enterprises. Regardless of size, even long-established and flourishing enterprises, as in the case of the Italian furniture industry, are vulnerable to changes in their external environment. This is nothing new, except that the increased pace of globalization and the emergence of a “flat world” (Friedman, 2005) has enhanced the uncertainties, and such changes are better documented and reported now than before. Small-scale enterprises have an important role in almost all sectors – agriculture, animal husbandry, fisheries, forestry, industry, services, etc. – and in some countries they form the basis of livelihoods for most of the population. Traditionally most small enterprises have been designed to meet the demand from local markets. Going beyond the local markets requires upscaling in the volume or value of production. In a business environment that is primarily oriented towards the development of large enterprises, small enterprises operate on an uneven playing field. Globalization has added a new dimension to this imbalance; while new opportunities have emerged, so also have challenges, especially when political, social, economic and technological differences among countries enhance the unevenness of the playing field. Managing this disparity has become the major thrust of discussions relating to world trade and development. Small enterprises play an important part in the processing, transport and marketing of wood and non-wood products. Increasingly even wood production is moving into the domain of smallholders in many countries. Provision of environmental services such as recreation is another area in which small enterprises are increasingly involved. This article examines some of the economic issues confronting small-scale enterprises, including those in the forest sector. It focuses on the links among scale, markets and economic performance, particularly in the context of globalization. After analysing the dynamics of the development of small enterprises, including the implications of changes in value chains, it presents key issues relating to the future development of small enterprises and the relevance of various interventions. Human enterprises range along a size continuum. At one end are small family-managed units (microenterprises) with limited investments, largely drawing on local resources and skills and producing for local markets. In forestry these include enterprises dealing with sawnwood production through pit-sawing, charcoal production and collection and processing of non-wood forest products. At the other end are large corporations with multi-billion dollar investments drawing on resources from almost everywhere and catering to markets on every continent. These are represented in forestry by large sawmilling, plywood and pulp and paper units, large plantation companies and furniture retailers. The distribution of enterprises along the continuum changes over time depending on changes in the overall economic, political and institutional environment. The current and emerging role of small-scale enterprises needs to be understood in this larger context. Small and medium-sized enterprises dominated all spheres of economic acti­vity until the beginning of the industrial revolution when technological advancements, especially in manufacturing and transportation, enabled some of these enterprises to scale up production. Larger enterprises, both public and private, benefited significantly from improved access to inputs and to emerging large markets, national and global. They became symbols of progress, influencing policies, legislation and investment priorities. Of considerable importance was the emergence of transnational corporations, whose share in the production and distribution of products and services has increased enormously in recent decades, as has their direct and indirect influence on national and international policies. Nevertheless, small-scale enterprises remain a vibrant segment of most economies. Notwithstanding efforts to provide an identity based on criteria such as size of landholding, number of workers employed and capital invested, small enterprises comprise highly heterogeneous activities, producing a variety of products and services, using diverse technologies and catering to the demand from different markets. Increased attention to their development largely stems from their role in enhancing income and employment, production of basic needs goods and alleviation of poverty (FAO, 2005; Kozak, 2007). The large number of start-ups and closures reflects the dynamism in the small-scale sector. Small enterprises epitomize individual initiative; since the investment requirements are low and entry is relatively easy, individuals can take risks and invest in small enterprises and leave the business when the going becomes tough. As a corollary, many small enterprises lack the necessary skills and resources to operate effectively and are ill prepared to deal with problems. In particular they face severe constraints in attracting management skills. Consequently, closures of small-scale enterprises are high. In India, for example, almost 37 percent of 23 million small-scale industrial units surveyed during 2001/2003 were found closed. Detailed data collected from about 750 000 of the working units revealed that about 14.5 percent were ailing, with erosion of net worth by more than 50 percent, delay in repayment of loans by more than 12 months or decline of gross output during the three consecutive years (Government of India, 2003). A majority reported lack of demand as the main problem. The future of small-scale enterprises, including those in the forest sector, will depend in large part on their ability to adapt to changing markets, technological improvements, transition from the informal to the formal sector and the characteristics of the value chains in which they take part. The scale of enterprises is closely related to the size of the markets, the characteristics of products demanded and the technology adopted. Transportation constraints have particularly favoured small-scale production, processing and trade of wood and non-wood forest products in many countries. Both demand for products and supply of inputs have been dictated by local socio-economic conditions favouring the adoption of simple traditional technologies. During the past few decades, however, the products demanded and consequently the characteristics of the enterprises have significantly changed. As the demand for many traditional products declines, new markets are emerging. Bamboo products provide an example. In many countries, small-scale production of bamboo baskets and mats catered to the demand from the agriculture sector – until changing agricultural practices and the emergence of substitute products, especially plastic wares, undermined the demand for them. 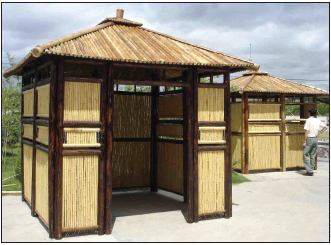 New technologies and markets have led however to the emergence of enterprises producing a variety of other bamboo products, including handicrafts and panels. However those who lost out by the decline in demand for traditional products are not necessarily the ones who are benefiting from the new opportunities. Catering to mass markets requires scaling up of operation at some stage in the value chain. Economies of scale are particularly significant in mechanized processing, transportation, innovation and marketing. Sawnwood, panel products and especially pulp and paper are increasingly produced in larger units, which helps to reduce unit costs and thus increase competitive advantage over small-scale production. Scale economies are less pronounced in production processes involving land and labour, as illustrated by the increasing emphasis on smallholder involvement in wood production through industry–community partnerships. As the characteristics of the products demanded in the market change, technological improvements become necessary. Successful enterprises invest substantial resources in innovation to create new products or improve existing ones, and more importantly to promote them. However, scale economies in innovation and marketing confer distinct advantage on large enterprises. Indeed many large enterprises focus on these as their core competencies, while outsourcing production to smaller units. Investment in innovation has high risks; few small-scale enterprises venture into product development and promotion. Large enterprises are also in a better position to safeguard their innovation, e.g. through patents. In recent years, the overall technological and capital intensity of production has increased substantially for small-scale enterprises as for others. Enterprises that depend entirely on natural factors of production, especially land and unskilled labour, are unable to cater to changing markets requiring high-quality refined and processed products. Yet new and miniaturized production tools are revolutionizing small-scale production. Those small-scale forestry enterprises with low technology intensity are likely to be overtaken by others that are more technology intensive and efficient. A large proportion of small-scale enterprises, especially in developing countries, operate in the informal sector, outside the framework of established rules and regulations. The informal sector is relatively easy to enter and to leave, hence its predominance in low-income situations. Informality also compels enterprises to operate on a smaller scale and to be less “visible”, as is the case with many small-scale forestry enterprises. Such enterprises often provide only part of owners’ and workers’ income and employment. Many small-scale forest enterprises (e.g. collection and processing of non-wood forest products, charcoal production, pit-sawing and tree farming) are part-time or seasonal activities. The preponderance of the informal sector is also due to the enormous barriers to entry to the formal sector, including complex rules, procedures and regulations (World Bank, 2006) and, in the forest sector, ill-defined property rights. In many countries registration of enterprises is extremely tortuous and time consuming and often involves substantial costs, including bribes. For most small-scale units these costs are not commensurate with the benefits of entering the formal sector. Depending on the overall state of governance and transparency, the transaction costs that small-scale enterprises incur can be very high. There are hence strong incentives to operate in the informal sector (see Box). Operating in the informal sector however imposes a number of other costs. The informal sector remains crowded, driving down income and causing depletion of resources. This is particularly so in the forest sector, for example in the collection of wood and non-wood forest products. Of course the informal sector also has rules and regulations, enforced by individuals or groups operating outside the framework of established systems (often criminalizing the activity). Removal of entry barriers and reducing the transaction costs seems to be the only option to encourage the shift from the informal to the formal sector. The size of the informal economy and the share of small and medium-sized enterprises vary depending on the level of development. Typically in low-income countries, informal activities, including small and medium-sized enterprises, account for 47 percent of gross domestic product (GDP), while registered small and medium enterprises contribute 16 percent and large enterprises the rest. In middle- and high-income countries the share of informal activities in GDP declines to 31 and 13 percent, respectively, while that of small and medium enterprises increases to 39 and 51 percent, respectively. This enormous increase in the share of small and medium-sized enterprises is due to an improvement in the business environment, especially a reduction in the transaction costs of moving to the formal sector. One of the most important impacts of globalization has been the rapid growth of international trade and the corresponding changes in value chains. A value chain is the connected series of enterprises, activities, resources and knowledge streams involved in creating and delivering products and services to end users. As more and more of the production is traded, the proportion of imported products in the consumption basket increases, signifying the growth of global value chains and a corresponding contraction or stagnation of local value chains. Long-term performance of small-scale enterprises will depend on their linkage with the value chains and the extent to which they are able to influence the distribution of benefits along them. While value chains can be local, regional, national or global, for convenience of analysis attention here focuses on the local and global value chains. Local value chains. 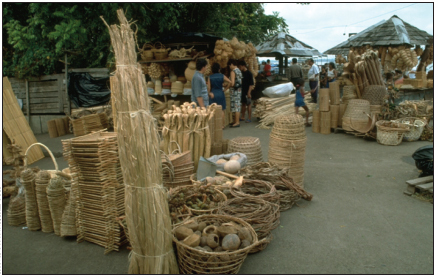 Historically, small-scale enterprises – including many that are forest based, for example enterprises producing bamboo baskets and mats, charcoal, pit-sawn wood, furniture and non-wood forest products – have been part of local value chains which are characterized by a limited number of stages between production, processing, trade and end uses. Sometimes many of these functions coalesce in one enterprise. Income generated by small enterprises depends largely on the nature of local demand and the overall state of the local economy. Enterprises catering to low-income markets, typical of most developing countries, often find it difficult to make ends meet. Very few are able to generate surpluses that could be reinvested in enterprise improvements. Often, small-scale forestry enterprises are more isolated from markets and key services (such as finance) and are operated by socio-economically weaker sections of society (often indigenous peoples). Having limited opportunities, these groups reap less income from such enterprises and are therefore less able to invest to improve product quality, scale up production and improve enterprise management. Moving up the value chain entails substantial costs for small enterprises, including scaling up of production and moving into the formal sector. Small enterprises are also vulnerable to competition from low-cost producers elsewhere, especially when the quality or characteristics of the products are perceived to be better. In a number of instances low-cost production linked to global value chains has more or less decimated local small enterprises. The future of small-scale enterprises linked to local value chains, especially in low-income environments, is precarious. As income goes up and lifestyles change, the enterprises have to upgrade their products or will find their market share completely eroded. Traditional forestry enterprises linked to local value chains face particular problems as they are largely dependent on locally collected low-value raw material and unskilled labour. Global value chains. As globalization advances, the reach of global value chains is expanding. They involve multiple players and stages, linking production, processing, logistics, advertisement, wholesaling and retailing – and are thus complex to manage. These value chains are transforming production, trade and investment (Abonyi, 2007), helping to scale up the volume of production and facilitating improved processing. The survival of small enterprises increasingly depends on their ability to link with global value chains. Even environmental services such as provision of recreational amenities, carbon sequestration and protection of biodiversity will require scaling up of activities requiring some linkage with global value chains. The share of benefits that small enterpreneurs draw from participating in global value chains depends on the indispensability of their contribution, their understanding of the overall functioning of the value chain, transparent information and communication flow up and down the value chain, and their bargaining ability. Substantial differences exist in this regard between joining an established value chain and creating a completely new one. Established value chains can ease the process of scaling up or qualitative improvement necessary to tap distant markets. Critical scaling up functions such as product design, logistics, branding and retailing are taken up by global players, while the small enterprise focuses on production. However, small enterprises unfamiliar with the functioning of such large value chains may not fully benefit from joining them, even if the product ends up in high-income markets (see Box). To participate in some global value chains driven by transnational retailing organizations, enterprises must adhere to rigid specifications and tight delivery schedules, which may curtail their independence, initiative and flexibility. In the wooden furniture industry, transnational retailers who control critical functions garner a significant share of the final value of the products (Kaplinsky, Morris and Readman, 2002). Decline in unit prices has compelled retailers to source supplies from countries where costs are low, shifting the location of furniture production, for example to some Eastern European countries, China, Viet Nam and Indonesia (Kaplinsky and Readman, 2005). This race to the bottom has increased competition among small-scale enterprises often supplying the same global value chain – resulting in wage reductions, unacceptable working conditions and even the use of illegally procured timber (Loebis and Schmitz, 2005). In some instances, for example the South African furniture industry, growth in exports has actually resulted in a decline in real income (a phenomenon known as “immiserizing” growth) (Kaplinsky, Morris and Readman, 2002). Where well-established value chains exist, it is extremely difficult to create similar ones, leaving little option for small-scale enterprises to broaden their market access. Public pressures, especially from consumer groups, could help ensure social and environmental responsibility, enabling a fair and just distribution of benefits among the participants in the value chain. For example, the voluntary code of labour practice of the Ethical Trading Initiative, an alliance of companies, trade unions and non-governmental organizations, has significantly helped to improve working conditions (Barrientos and Smith, 2006). Fair-trade organizations have helped to create new value chains focusing on niche markets, taking advantage of the willingness of consumers to pay a higher price for products that are environmentally sustainable and socially acceptable (Redfern and Snedker, 2002). Creation of such new value chains has helped to revive small-scale enterprises (see Box). However a major problem with niche markets is their volatility, especially when production and processing technologies are amenable for easy copying. While global value chains offer new opportunities for small enterprises to overcome some market constraints, participation in them is demanding in terms of product quality specifications. Small enterprises have to work in a more formal situation and to upgrade their production and management skills. Adherence to international standards, especially on health and safety, is critical. These requirements are often beyond the capacity of small-scale enterprises, leading to their exclusion from the more remunerative markets (Abonyi, 2007). For example, accessing markets for certified forest products is much easier for large plantation companies than for small-scale growers. Handmade paper based on lokta (the forest plant species Daphne bhoula and Daphne papyracea) has been produced in Nepal since at least the twelfth century, when it was produced in several locations for government records and religious texts. Following competition from imports, first of handmade paper products from Tibet around the 1930s and then of machine-made paper from India, by the 1960s the handmade paper industry in Nepal had almost collapsed. Traditional knowledge of lokta paper production was limited to only a few families in the Baglung and Parbat districts. Growth of tourism in the 1970s led to the revival of the industry and subsequently brought to light the opportunity for tapping international markets. The UNICEF/Agricultural Development Bank Nepal (ADBN) project “Community Development through the Production of Handmade Paper”, launched in 1980, took advantage of favourable market opportunities by facilitating the creation of a global value chain. It developed a craft factory whose final products include UNICEF greeting cards. Currently there are about 600 handmade paper units in the country, including 377 registered units. Of these, 175 produce about 30 000 tonnes of paper products annually. The industry is currently growing at an annual rate of 16 percent and paper is now made in 16 hill districts. Community involvement in the management of forests through forest user groups has favoured regeneration of Daphne spp., and a number of forest user groups have taken up handmade paper production. The industry is reported to employ about 28 000 persons of which more than 70 percent are women. Source: Biggs and Messerschmidt, 2005; Subedi, Binayee and Gyawali, 2006.
creation of an enabling environment for business, in particular to remove many of the obstacles that impose high transaction costs on small enter­prises (Donovan et al., 2006). While some of these interventions have been aimed to address the diseconomies of small-scale production, most have been pursued to fulfil broader socio-economic objectives such as employment and income generation, poverty alleviation and rural development. Earmarking products exclusively to the small enterprise domain has been ineffective. It has curtailed competition, encouraged inefficiency and prevented the evolution of vigorous small-scale enterprises. Many small enterprises have become dependent on protectionist measures and substantial public subsidies, which curtail their long-term innovation, efficiency gains and ability to withstand competition in a global environment (Bhavani, 2006). Provision of business development services in most developing countries has been largely in the public domain and has been inefficient and highly dependent on public subsidies. This is increasingly being taken up by associations, cooperatives and clusters, which often function efficiently, as in the case of tree growers’ associations in some countries or clusters of furniture producers. However, their effectiveness largely depends on the overall political, social and economic environment. Growing attention is therefore being focused on improving the overall business environment, to remove the economy-wide barriers to entrepreneurship. This is particularly important to reduce the costs of doing business and to facilitate the shift from informal to formal activities, which opens up many opportunities for small enterprises including improved access to credit, markets and technology. An improved business environment also encourages innovation and entrepreneurship and helps to mobilize the resources from the “bottom of the pyramid” (Prahalad, 2005), i.e. the numerous people in the-low income strata, that currently remain untapped. However, creation of a favourable business environment is a major challenge as it is linked closely to improved governance and broader political, social and economic development. As globalization advances, a major policy dilemma that most countries face is how to protect domestic enterprises from real and perceived unfair competition from imports. Certainly political, economic and institutional differences among countries do result in unevenness of the playing field, providing competitive advantages to those operating in a supportive environment. The demand for protective barriers to prevent “unfair” competition will be strong but should be avoided in favour of building up internal capacity along with gradual opening up to competition (Bhagwati, 2004). What will happen to small-scale enterprises, including those in the forest sector, will largely depend on the overall social, economic and technological changes. Certainly small enterprises will continue to have an important role in the production of goods and services and in the generation of substantial employment and income in almost all countries, both developing and developed. However, the character of these enterprises will change, dictated by changes in demand. Many traditional enterprises are likely to vanish as the demand shifts to different products. At the same time new opportunities are springing up as production of wood and non-wood products moves away from large public-sector and corporate entities. While many small enterprises will become strongly linked to global value chains, others will continue to function independently, focusing on national and global niche markets. A shift from mass-produced to custom goods will particularly favour small-scale enterprises. In particular, developments in information and communication technologies will considerably benefit small enterprises, helping them to move into new areas of production. These technologies are already beginning to erode the disadvantages that small enterprises previously faced in obtaining information on markets and prices (Moodley, 2003). E-commerce is reducing transaction costs (Cox, 2004), and improvements in transportation technology are facilitating the sale of smaller consignments. In a way, the boundaries of local markets are expanding beyond what has traditionally been regarded as local. Those who are able to take advantage of these tools will push out those who are unable to do so. Continuous upgrading of technologies will become critical for maintaining competitiveness and thus survival. In facilitating the development of small-scale enterprises, an understanding of reality should prevail over romantic perceptions. Inherently small is neither beautiful nor ugly. Depending on the social, political and economic environment, small enterprises can exploit labour and natural resources in an ugly way, or they can contribute significantly to social and economic development and the livelihoods of the poor. What is required is an objective view of what small-scale enterprises can and cannot do. Priorities and strategies need to take the dynamics of long-term societal change into account to avoid the pitfalls of supporting enterprises just because they are small and forest based. Much of the thrust should be to nurture entrepreneurship and to provide a favourable environment for small-scale enterprises to develop on their own. Bhagwati, J. 2004. In defense of globalization. New York, NY, USA, Oxford University Press. Bhavani, T.A. 2006. Globalisation and Indian small scale industries: technology and competitiveness. New Delhi, India, Ane Books India. Biggs, S. & Messerschmidt, D. 2005. Social responsibility in the growing hand-made paper industry of Nepal. World Development, 33(11): 1821–1843. Cox, M. 2004. Exporting for small scale forestry enterprises. In Proceedings, International Symposium on Contributions of Family Farm Enterprises to Sustainable Rural Development, Gengenbach, Germany, 28 July – 1 August 2002, pp. 159-169. Freiburg, Germany, Forstliche Versuchs- und Forschungsanstalt Baden-Württemberg. Drucker, P. 1990. The new realities. New York, USA, Harper and Row. Friedman, T. 2005. The world is flat: a brief history of the twenty-first century. New York, USA, Farrar, Straus and Giroux. Government of India. 2003. Third All India Census of Small Scale Industries 2001–2002: quick results at a glance. New Delhi, India, Ministry of Small Scale Industries. Gumbel, P. 2005. Twilight in Italy. Time, 166(23): 20–25 (December 5). Kaplinsky, R., Morris, M. & Readman, J. 2002. The globalization of product markets and immiserizing growth: lessons from the South African furniture industry. World Development, 30(7): 1159–1177. Kaplinsky, R. & Readman, J. 2005. Globalization and upgrading: what can (and cannot) be learnt from international trade statistics in the wooden furniture sector? Industrial and Corporate Change, 14: 679–703. Kozak, R. 2007. Small and medium forest enterprises: instruments of change in the developing world. Washington, DC, USA, Rights and Resources Institute. Loebis, L. & Schmitz, H. 2005. Java furniture makers: globalisation winners or losers? Development in Practice, 15(3/4): 514–521. Macqueen, D., Bose, S., Bukula, S., Kazzora, C., Ousma, S., Porro, N. & Weyerhaeuser, H. 2006. Working together: forest-linked small and medium enterprise associations and collective action. Gatekeeper Series No. 125. London, UK, International Institute for Environment and Development (IIED). Moodley, S. 2003. E-commerce and export markets: small furniture producers in South Africa. Journal of Small Business Management, 41(3): 317–324. Prahalad, C.K. 2005. The fortune at the bottom of the pyramid – eradicating poverty through profits. Philadelphia, Pennsylvania, USA, Wharton School Publishing, University of Pennsylvania. Redfern, A. & Snedker, P. 2002. Creating market opportunities for small enterprises: experiences of the fair trade movement. SEED Working Paper No. 30. Geneva, Switzerland, ILO. World Bank. 2006. Doing business in 2007: how to reform. Washington, DC, USA.